We are organizing a special session on awareness systems at the 4th International Conference on Intelligent Enviroments (IE09). Deadline for submission March, 13!! ASTRA is co-organizing a workshop on architectures and platforms for AMI. Objectives of the workshop are to promote knowledge exchange across projects and to define a roadmap for research in the area. !! !Submission Deadline: 20 October EXTENDED!!! We would like to invite you to submit a position paper (max 4 pages) to the AMI 2008 workshop Architectures and platforms for AMI. 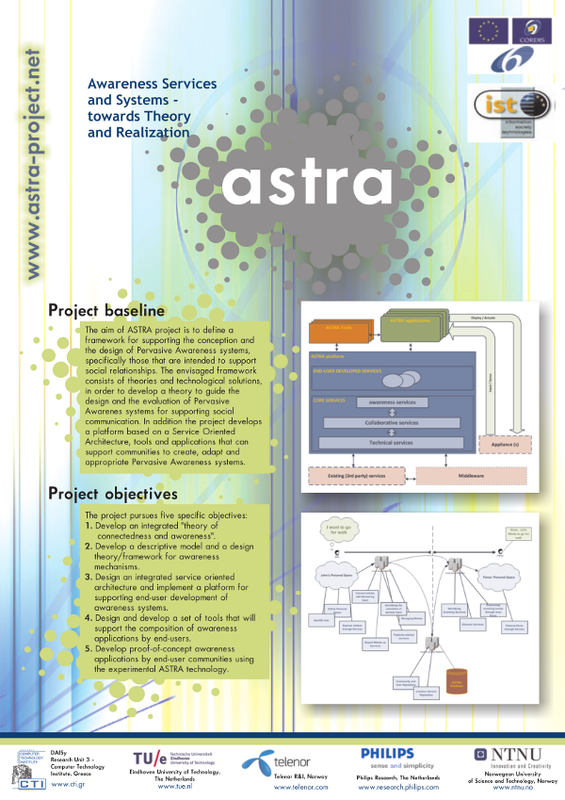 The new website of ASTRA Project is ready! Powered by Drupal CMS software, the ASTRA site is now more community oriented, providing easily updated content, news and stories submition, video and image uploading, personal and community blogs and a redesigned forum, all fully integrated and easily accessed. Enjoy the ASTRA Community!